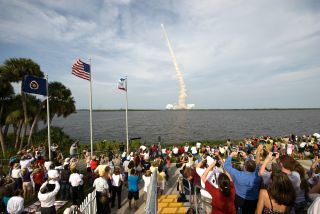 Crowds fill NASA Kennedy Space Center's Banana River viewing site to see and record space shuttle Endeavour as it roars into space on the STS-127 mission on July 15, 2009. Whether you've never seen a space shuttle launch before, or you've seen a hundred, now's the time to do it. Your last to chance to see NASA's iconic space plane blast off into space is coming up in just a few days. On Friday, July 8, at11:26 a.m. EDT (1526 GMT), the space shuttle Atlantis will lift off on the 135th and final space shuttle flight ever. After that, NASA's three space shuttles will be retired to museums while NASA focuses on getting humans to Mars. If you're thinking about viewing the launch in person from somewhere near NASA's Kennedy Space Center in Cape Canaveral, Fla., you're not alone. NASA officials have said they expect up to 750,000 spectators to watch the liftoff from the Space Coast area, though experts say the number will likely top 1 million. NASA's STS-135 mission aboard Atlantis is a 12-day flight that will deliver supplies and spare parts to the International Space Station. After this mission, the space agency will retire its three-shuttle fleet for good to make way for a new program aimed at deep space exploration. Picking a spot is the largest decision you've got to make. NASA sells a limited number of tickets to view the launch from either the NASA Causeway, about 6 miles (9.6 km) from the Atlantis' Launch Pad 39A, or from Kennedy Space Center's Visitor's Center. However, both sites have been sold out for weeks. At the time of writing, tickets for the causeway were selling for upwards of $500, some for as much as $1,000, on eBay. If you don't want to shell out that kind of money, there's good news. Great viewing spots abound on Florida's Space Coast, and they're free. The town of Port Canaveral, a popular harbor for cruise ships, is also a good choice, affording largely unobstructed views. "Titusville will always be the number one choice, and the second best is Port Canaveral because it's only about a mile farther and you can see the pad clearly from there," Cooper said. "Either way you're still talking about major parking issues." Another good option for shuttle viewing is a spot along the coast in the nearby city of Cocoa Beach. "You won't see the launch pad itself, but you'll see everything else," Cooper said. "I have no doubt the beach will be packed too," but its large size will mitigate some of the effects of the crowds, he said. Your next major decision is when to show up. Clearly, the earlier the better. "Definitely before the sun comes up," Cooper said. "If you want a front row spot ,you're going to want to get there nine to 12 hours out at least." He predicted the bulk of the hordes would show up about five to seven hours before liftoff time, so just a few hours earlier should put you ahead of the crowd. "There's no question some people will be staking out spots the night before," Cooper said. With hours to kill before things get exciting, it's a good idea to bring snacks, games and books to keep yourself from going stir-crazy. It's worth taking some time to think about what you want to do when the moment finally comes. "Most important is to view the launch with your own eyes and not take too many pictures," Cooper recommended. He advocated deciding ahead of time at what stages of the liftoff you'll snap pictures, and at what points you'll put the camera down and just take in the scene. When you do snap the camera, be sure to capture some scenes of the crowd, as well as the rocket, and frame some shots with a tree or a pier in the foreground, Cooper suggested. One final tip: If you can't make it to Cape Canaveral to watch Atlantis' final launch, NASA has a digital alternative. The space agency, as well as countless other media outlets, will broadcast the launch countdown and liftoff live on its NASA TV channel, which you can access by clicking here.